Although early spring sometimes brings cold snowy weather, here in South Dakota, it usually doesn’t last long this time of year. After a day or two, the snow melts in late March and early April. Sometimes this type of weather creates chaos on the farm in early spring. You just never know a month or more in advance what the weather will be when the barnyard animals give birth, and a sudden cold snap can cause problems for newborn animals. Several years ago we had a doe kid (first born of twins born to our alpine doe, Claire) who was delivered during a freakishly cold weekend in March and ended up with a frostbitten back leg. 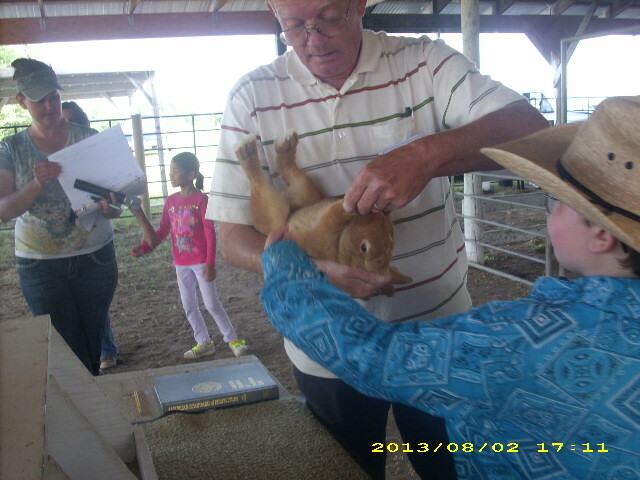 On the other-hand, livestock having babies and increasing their family-size is the backbone of 4-H livestock projects. To enable our 4-H’ers to grow their rabbit herds, we recently purchased 2 nest-box heaters for keeping litters warm until the babies grow fur (like rodents, baby rabbits are born bald.) The mothers do pull fur to line their nests from their belly and sides, but if it is chilly and/or windy, this is often not enough and early litters are easily lost to exposure. 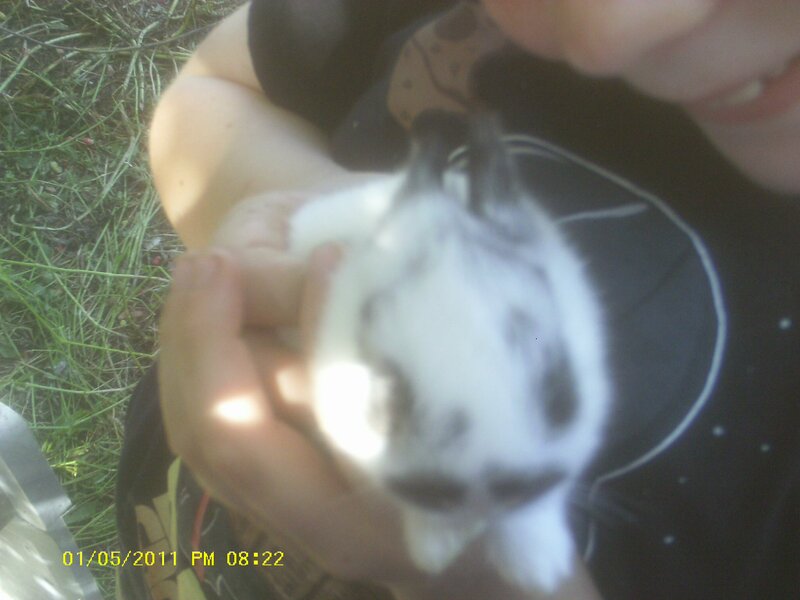 This year, we started off our 4-H projects by breeding Henry’s doe, Lady to his new blue Mini Rex buck, Slurpie, and Charles’ new doe, an albino New Zealand named Crystal, to his red buck, Lakota, in late Feb. Lady delivered a nice all blue litter of 5 kits on March 26th. Crystal kindled the day after, but had her 8 babies on the cage floor and lost them all to the cold. Pa made a mistake in leaving her dead litter for me to see. A rodent of some sort (out in the barn) ate the dead kits, then managed to get into Lady’s hutch and got her babies too. The weekend after, we bred Lady’s daughter, Beauty, Henry’s castor-colored doe, Anna-Beth and Charles’ red doe and rebred Crystal. Two weeks prior to that, we had bred Charlotte to Slurpie and Blur to Lakota. Both Charlotte and Blur are due to kindle next Saturday. If all goes well, it will really get hopping around here. As a side benefit, we should have a fabulous increase in rabbit manure to fertilize our garden in the coming months of spring and summer. 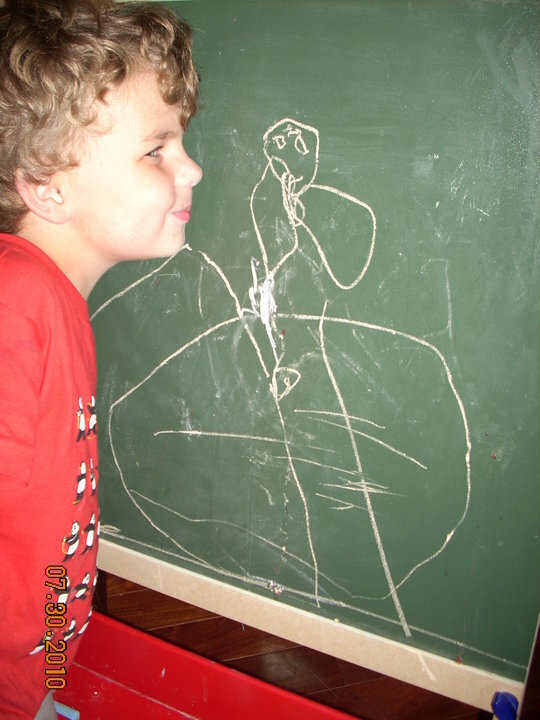 Today marks the end of National Cub-Scouting Week, so I thought I would dedicate my post today to our 2 young Cub-scouts and their accomplishments. Unfortunately, it’s been a couple months since they have attended meetings, between weather issues, meetings that were canceled by their den leaders for various reasons and somebody at home being sick with some sort of illness almost constantly since before Christmas. 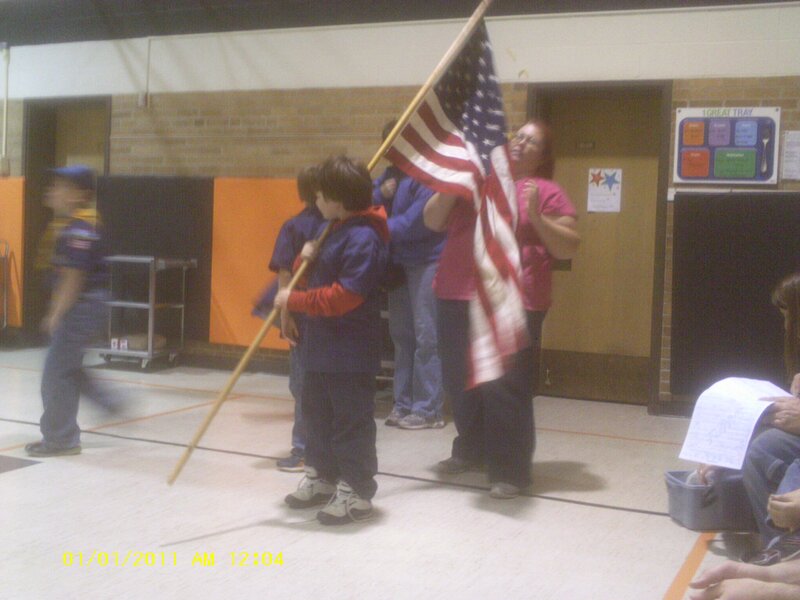 But, back in November at our Pack Meeting, Charles participated in the Flag Ceremony and did a very good job of it. 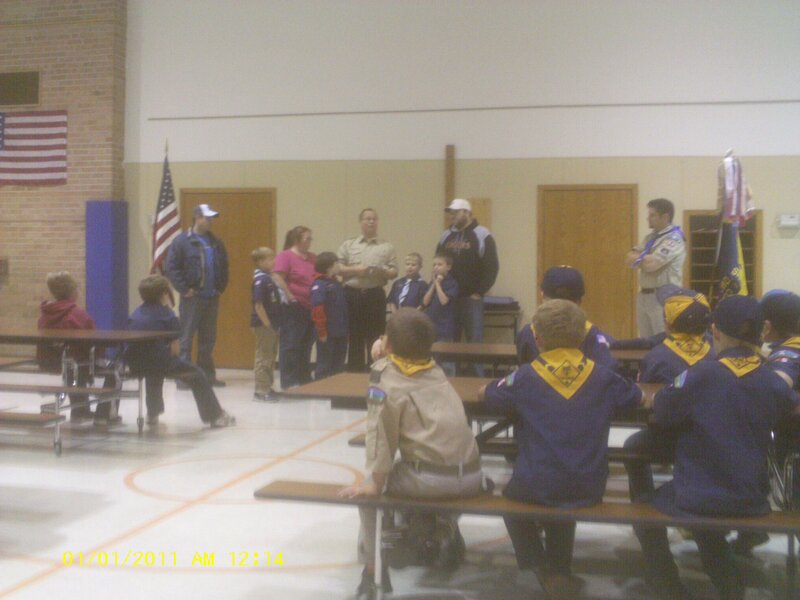 At this meeting, both Charles and Henry also earned their Bobcat Badges… the first of many to come. 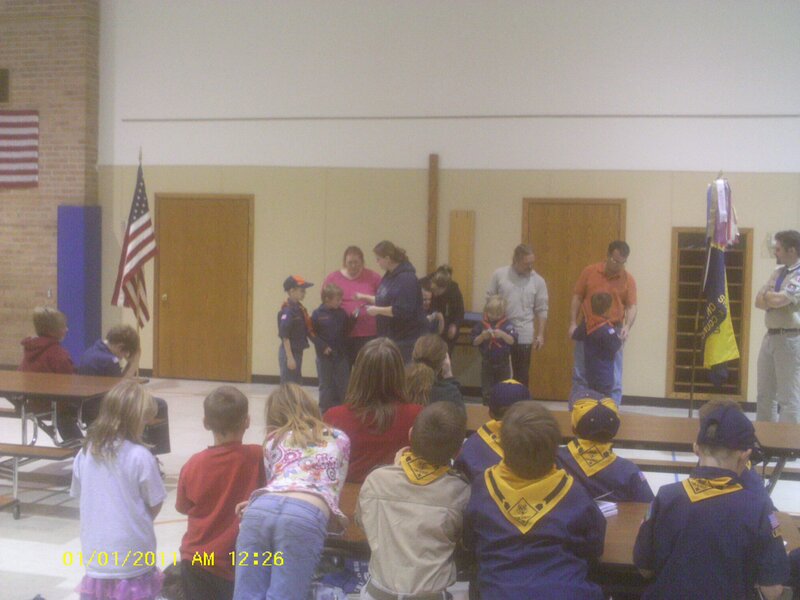 Henry’s Tiger Den made their $200/scout quota for selling popcorn. Charles’ Bear Den exceeded the $200/scout quota and averaged about $350/scout. Charles was a great little salesman and earned $358 in popcorn sales for the Pack. Both of them did AWESOME! Both Henry and Charles have been working hard on their bowling skills with their Grandpa Bill in order to earn their belt loop awards for the sport of bowling.